The Only Way Is Essex‘s James ‘Arg’ Argent, TV presenter Sarah-Jane Crawford and former X Factor contestant Frankie Cocozza are set to appear on the next series of Celebs Go Dating. Celebs Go Dating is making a return to E4 soon, which means a new batch of celebrities will be joining Lady Nadia Essex’s dating agency in the hope of finding love with a ‘normal’ member of the public. Up for the dating action this series we have Arg, Sarah-Jane and Frankie, and they will be joining the likes of Ex On The Beach‘s Charlotte Dawson, Made In Chelsea‘s Georgia ‘Toff’ Toffolo, TOWIE‘s Bobby Norris and Calum Best. Now, that’s quite a line-up! And Bobby will be making Celebs Go Dating history as he will be the first gay contestant to take part in the series. 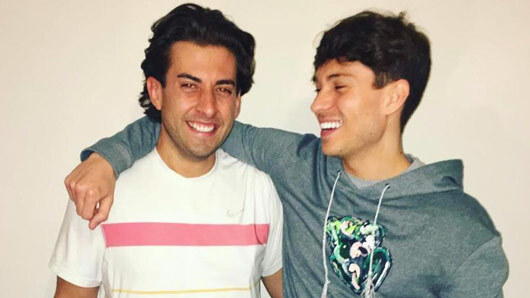 It will be a special occasion for his TOWIE co-star Arg as well, who will be be appearing on television for the first since quitting The Only Way Is Essex and going to rehab in Thailand. A source recently informed The Sun newspaper: “James and his reps think Celebs Go Dating has come at the right time for him. “He’s back on good form and feeling better than ever – all that’s missing is someone to share it with. Well, we’re glad to have a couple TOWIE stars to fill that prominent Joey Essex shaped hole in the programme! The last two series of Celebs Go Dating have been a total hit with viewers at home and the series’ famous faces have included the likes of Stephanie Pratt, Charlotte Crosby, Stephen Bear, Ferne McCann and Jorgie Porter. Alongside hours worth of wonderfully cringe dating experiences, the show also usually involves a scandal or two, with Steph and Joey going against the rules by dating each other in season one and Bear actually getting chucked off the programme in season two. So, we’re preparing ourselves for another dose of celebrity drama this time around! Celebs Go Dating returns soon to E4.